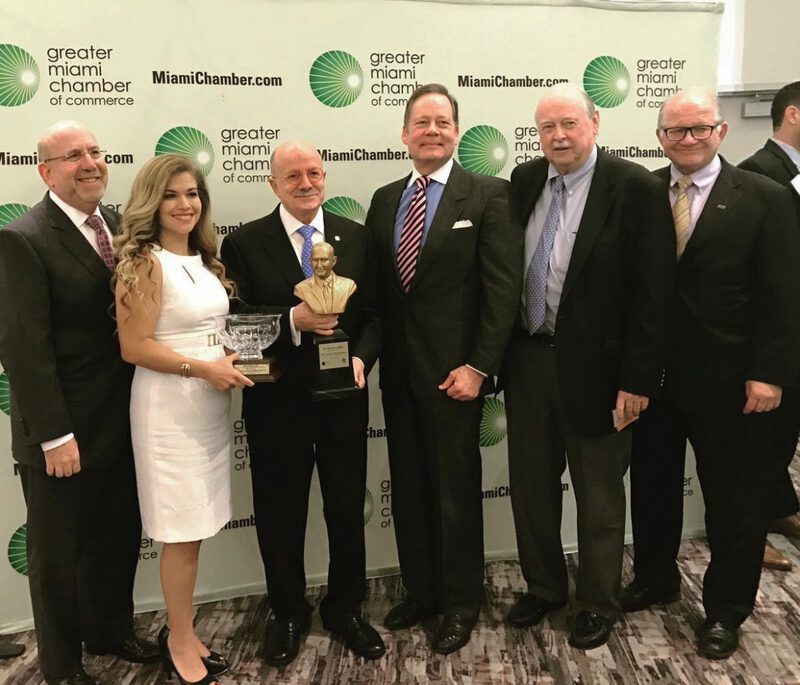 The Greater Miami Chamber of Commerce presented the third annual Alvah H. Chapman, Jr. Award of Excellence on November 4, 2016 during its Trustee’s luncheon. The awards recognize the outstanding achievements of an individual, an organization and young leader who have made significant contributions and set standards for the development of Miami’s central business core’s economy, culture, promotion, education, beautification and preservation. The awards were made possible by The Allen Morris Company, founder, visionary and presenting sponsor of the Greater Miami Chamber of Commerce Alvah H. Chapman, Jr. Award of Excellence; and sponsored by Miami Downtown Development Authority, TD Bank, Akerman, Bilzin Sumberg, Dosal Capital/Check Point Software Technologies and Communis Creative. INDIVIDUAL: Eduardo J. Padrón arrived in the United States as an unaccompanied teenage refugee in 1961. Since 1995, he has served as President of Miami Dade College (MDC), the largest institution of higher education in America with more than 165,000 students. He is credited with elevating MDC into a position of national prominence among the best and most recognized U.S. colleges and universities. During his more than four-decade career at MDC, President Padrón has engineered a culture of success that has produced impressive results in student access, retention, graduation and overall achievement. Under his leadership, MDC has emerged as an essential leader for South Florida’s growth and prosperity. MDC graduates boost the local economy and contribute upwards of $3.3 billion annually in added income to the Greater Miami community. President Padrón has also pioneered numerous innovative programs that have greatly impacted the economy in the downtown area. An economist by training, Dr. Padrón earned his Ph.D. from the University of Florida. In 2009, TIME magazine included him on the list of “The 10 Best College Presidents.” In 2010, Florida Trend magazine named him “Floridian of the Year.” In 2011, The Washington Post named him one of the eight most influential college presidents in the U.S. Also in 2011, he was awarded the prestigious Carnegie Corporation Centennial Academic Leadership Award. More recently, he received the Citizen Service Award from Voices for National Service, the Aspen Institute Ascend Fellowship and the Hesburgh Award, the highest recognition in higher education. President Padrón is widely recognized as one of the top educational leaders in the world and is often invited to participate in educational policy forums in the United States and abroad. His energetic leadership extends to many of the nation’s leading organizations. He is the past chair of the board of directors of the American Council on Education (ACE), the Association of American Colleges and Universities (AAC&U) and the Business-Higher Education Forum (BHEF). He serves on the boards of the Council on Foreign Relations and Achieving the Dream, Inc. He has been appointed to key national posts by six American Presidents. He is also a prolific writer and has more than 15 honorary doctorates. Internationally, President Padrón’s accomplishments have been recognized by numerous nations and organizations including the Republic of France, which named him Commandeur in the Ordre des Palmes Académiques; the Republic of Argentina, which awarded him the Order of San Martin; and Spain’s King Juan Carlos II, who bestowed upon him the Order of Queen Isabella, and Spain’s Prince and Princess of Asturias, Felipe and Letizia, who presented him with the Juan Ponce de Leon 500th Anniversary award. ORGANIZATION: Swire Properties Inc., headquartered in Miami since 1979, is the U.S. real estate subsidiary of Hong Kong and London based Swire Pacific Holdings Ltd, a 200-year-old, listed multinational corporation with principal interests in trade, aviation and real estate. In its 30-year history in Miami, Swire Properties’ primary focus has been the ongoing master planning and development of Brickell Key in downtown Miami, where the company has invested some $1 billion in creating one of the premier urban mixed-use developments in the United States. Swire Properties has invested an additional $50 million as co-developer of JADE, a super luxury, highly successful condominium in Miami’s famous Brickell corridor, and continues to shape the Miami skyline with its latest project, Brickell City Centre, a landmark $1.05 billion mixed-use complex. With a small core team, Swire Properties has completed on the island community of Brickell Key, the award-winning Courvoisier Centre office complex, the Brickell Key Marketplace, Courvoisier Courts luxury apartments and 1,970 condominium units in Brickell Key One, One, Two and Three Tequesta Point, Courts Brickell Key, Carbonell, and the $110 million hotel Mandarin Oriental, Miami, a joint venture with Mandarin Oriental Hotel Group. Most recently completed on Brickell Key is Swire’s $120 million ASIA condominium which contains 123 residences. Today, Swire Properties has become a 50-person dynamo with global resources and synergistic subsidiaries that include Swire Development Sales and Swire Realty. For its individual properties and for Brickell Key as a whole, Swire Properties has achieved numerous industry and civic awards and commendations for outstanding design, construction quality, overall product merit and sustainability. Swire Properties, together with the entire Swire Group of companies, adheres to a rigorous policy of environmental standards. Either directly or through its affiliated companies, Swire Properties assumes a leadership role in many civic and charitable organizations, reflecting the company’s guiding philosophy of giving back to the community that sustains it. Swire has played a central role in the urban development of Miami and South Florida for more than three decades. The complete master-planning and incremental build out of Brickell Key in downtown Miami, an island city within the city beginning in the 1970s and now entering its final phase, represents a major mixed-use urban development that, in and of itself, would be the foundation a lifetime achievement. Swire’s latest venture, Brickell City Centre, represents the pinnacle of an extraordinary moment in the urban transformation of Miami: 5.4 million square feet of a complex, urban mixed-use project encompassing three city blocks, woven together with transit, underground parking and the sensational climate ribbon. One of the largest single mixed-use developments South Florida has seen, Brickell City Centre is destined to change the way Miamians live, work and play in the city’s increasingly prosperous residential and business district. YOUNG LEADER: Alice Bravo was appointed Director of the Department of Transportation and Public Works (DTPW) in February 2016. The department includes all functions of the previous Miami-Dade Transit, along with the County Engineer, Traffic Operations, Construction and Maintenance and Highway Planning, as well as the Passenger Transportation Regulation function. DTPW is responsible for Miami-Dade County’s entire surface transportation system, the planning, maintenance and operation of our roadways, transit system and taxicab and limousine services. Prior to the reorganization of Transportation and Public Works functions, Ms. Bravo held the position of Miami-Dade Transit Director. Transit is the 15th largest public transit system in the United States, and the largest in Florida. Ms. Bravo oversees the planning and provision of all public transportation services in the County. She leads the effort of improving and expanding transportation in the community by working closely with the federal government, Florida Department of Transportation, Miami-Dade County Metropolitan Planning Organization and Miami-Dade Expressway Authority, among others. As Director, Ms. Bravo oversees accessible transportation services in Miami-Dade County. This includes the Metrobus fleet that runs approximately 28.9 million miles through most areas of Miami-Dade County; the electrically-powered, elevated, 25-mile rapid transit Metrorail system; the 4.4-mile elevated Metromover; and the paratransit service (Special Transportation Service) that meets the needs of the disabled. Throughout her career, Ms. Bravo has been responsible for managing a number of diversified public-private partnership projects involving design, construction, finance, operation and maintenance, including the $1 billion PortMiami tunnel; the innovative I-95 Express Project; and the $550 million S.R. 826-S.R. 836 interchange reconstruction project. These projects have helped improve commuter mobility throughout Miami-Dade County. In her most recent position as Deputy City Manager/Chief of Infrastructure at the City of Miami, Ms. Bravo oversaw six departments, including Capital Improvements and Transportation, Public Works, Planning and Zoning, Building, Real Estate Asset Management, and Information Technology. She first joined the city as Capital Improvements Director overseeing a $573 million capital improvement program and was responsible for implementing the city’s trolley circulator system. Prior to joining the City of Miami, Ms. Bravo served as District Six Director of Transportation Systems Development with the Florida Department of Transportation. She was responsible for all production aspects of the District, including Planning, Public Transportation, Design and Right of Way, and Environmental Management. Ms. Bravo coordinated directly with the Secretary of Transportation, the Federal Highway Administration, the Miami-Dade County Metropolitan Planning Organization and elected officials regarding policy, funding and legislative issues. Ms. Bravo is a licensed Civil Engineer with a bachelor’s degree from the University of Miami and a Master’s in Business Administration from Florida International University. In 1976, a group of Miami’s top leaders met on the 38th floor of the new One Biscayne Tower to focus on the future of downtown Miami. At that time, signs of progress in downtown were stagnate, no new buildings were under construction and the existing plan for new development was near a standstill. As these leaders looked out at their city from that panoramic view, it became clear that what was lacking at that time was a plan of action. Alvah H. Chapman, Jr., then President of The Miami Herald, was called upon to lead this action-oriented committee of the Greater Miami Chamber of Commerce. He put his vision for Miami in a nutshell: “I have a simple philosophy. Of all the cities in America, one has to be the best. One has to make the most progress. One city has to show the way. Some city has to write the book on civic progress. Why couldn’t it be this Greater Miami community?” That day, the group’s vision evolved into a plan of action and a new name was given to the task. They called their program the New World Center. The mission of the program was to have a catalytic influence on downtown projects in respect of the public and private sectors.